The ultimate goal for immigrants coming to the United States is to obtain the right to live and work in the U.S. legally and permanently. While there are several options for becoming a permanent resident, attempting to navigate the application alone can be particularly stressful and overwhelming. Applicants are often plagued by uncertainty and the pressure of following strict regulations in a language different from their own. One misstep or inaccurate piece of information can jeopardize your chance for a new life and future indefinitely. If you or a loved one is seeking permanent resident status in the U.S., it is important to have a highly experienced and knowledgeable immigration attorney on your side. At LS&P Lawyers, our accomplished legal team has helped thousands of clients achieve their dream of becoming U.S. residents and citizens. To learn more about our services and to discuss your specific circumstances, please contact us by email or by dialing (844) 288-7978. We can help you through every step in your journey to permanent U.S. residency. Who May Apply for Permanent Residency? You must be eligible for family-based immigration, employment-based immigration, refugee or asylum, or other special circumstances. There must be an immigrant visa available to you, either as an immediate relative of a U.S. citizen or based on the number available that year for your particular category. You must be eligible for admission into the U.S. based on health, criminal record, and other factors determined by the United States Citizenship and Immigration Services (USCIS). Every immigration case is different and will be judged on a wide range of specific factors. To help strengthen your case, a skilled lawyer will be able to support your claim and fight on your behalf to ensure that your application is accepted. What are the Options for Obtaining a Green Card? Family Based: If you are an immediate relative (the spouse, unmarried child under the age of 21, or parent) of a U.S. citizen who is at least 21 years of age, he or she may petition for a green card on your behalf to allow you to enter and live in the U.S. permanently. 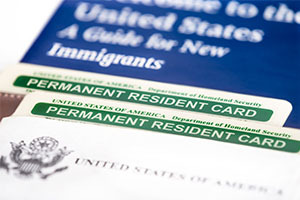 Other family members may qualify for family-based green card depending on his or her relationship to the U.S. citizen or other green card holder. There are numerous exceptions, as well, so be sure to consult with an attorney to determine your eligibility for this option. Employment Based: It is possible to become a permanent resident if you are sponsored by a U.S. employer who follows the appropriate application process. You may also be eligible for a green card if you make a significant investment into a new or existing enterprise in the U.S. or if you have an "extraordinary ability" or specialized job. Refugee or Asylee: If you have been admitted to the U.S. as a refugee, you must apply for a green card within one year of receiving admittance. If you were granted asylum status, you will be eligible to apply for permanent status within one year, as well, but it is not necessarily required unless you continue to qualify as an asylee. Why Call New Jersey Immigration Lawyers LS&P Lawyers? For many foreign citizens seeking permanent residence in the U.S., the path to becoming a green card holder can be overly-complicated and tedious, requiring years of dedication and significant financial investment. However, consulting with an esteemed immigration lawyer from the very beginning can help eliminate these complications. There are countless regulations and exceptions that may prevent the success of your application, but the NJ immigration law firm of LS&P Lawyers has the years of experience and up-to-date knowledge of U.S. immigration law necessary to help our clients avoid any missteps. Contact us to discuss your circumstances and eligibility for permanent residency during a free consultation. We are committed to providing efficient legal representation to individuals and families throughout the immigration process.